I first met Jimmy a handful of years ago in the Southeast. I had heard of all of his amazing accomplishments through the climbing world, but as always, it was great to put a face to a name. What struck me about him was how approachable and humble he was. 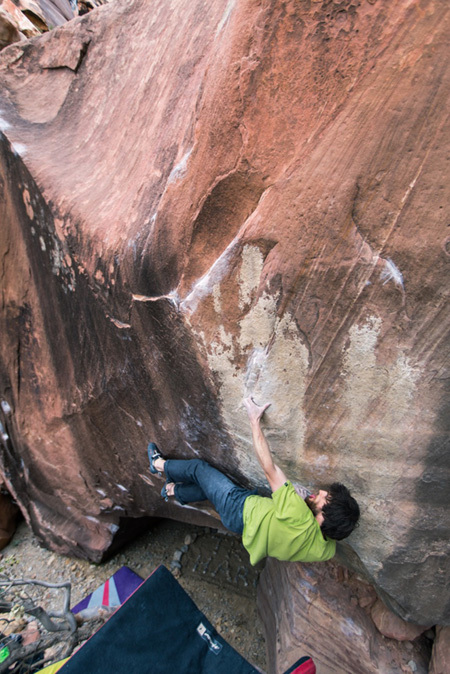 He is definitely one of the most accomplished boulders in the world, yet if you didn't have prior knowledge of that, he would be the last person to tell you. I ran into Jimmy again this past summer while we were in Squamish and he had been dispatching of most of Squamish's test pieces and putting up a few of his own. It was less than ideal climbing conditions during the heat of summer, but that didn't seem to stop him. You lived in Boulder and now are back in the Southeast, what were the plusses and minuses of each? What precipitated each move? JW: Well, when I first decided to make the move to Colorado, I was mainly just psyched to have so many hard climbs to try. CO has probably the highest concentration of hard boulders in the world and I wanted to be able to focus on each of them without having to travel across the country to them. After a year or so though I realized that where I truly want to live is in Chattanooga. For me, my happiness is so much more based around my sense of home and the community of friends who surround me. Personally, the South is just my style and we love it! Not to mention the rock is pretty damn good too! Who are climbers past and present that you look up to or had a big influence on you? Why? JW: For past climbers it is definitely Fred Nicole. He has always been a huge inspiration to me not only for his climbing ability, but the way he approaches climbing, development, and life in general. He's a real legend. For present climbers I would have to say my good pal Daniel Woods. He's stupid strong, literally, but the thing that impresses me the most about ddubs is his fight. He never backs down, never makes excuses, and will always come out on top no matter how long it takes. I honestly doubted his mental ability to take down The Process in Bishop, CA. I was there on his first round of attempts last year and I could see, for him this one was going to be all mental. In the end, he overcame and stood on top. That's inspiring! Both Chattanooga and Boulder are climbing centers, what is the difference in attitudes in the communities? And towards bouldering? JW: Yeah, both are very large centers for sure but I think the thing that separates the two is that Chatty doesn't feel like the center for anything. It's a decently large city but still holds that small town feel. Most everyone here is either from here or from a nearby city. Also, unlike Boulder, most everyone here holds a full time job. Haha. When it comes to climbing I'd say the biggest difference is that people here are more punctual. People work hard for a living here, and when they have a window to go climb, they're there, at the meeting spot, at 8 AM ready, to go. What do you look for or dream about in finding a new line? JW: Simply something tall, pure, and hard. The rock can be anything. The holds can be slopers, pinches, or crimps; it doesn't matter. I just dream of the line itself. Something that inspires me and keeps me awake at night. You have flashed more hard problems than a lot of hard boulderers combined, do you do anything to prepare yourself mentally for that? How do you rise to the occasion? JW: I'm definitely a bit obsessive when it comes to bouldering so maybe that has something to do with it. Often times when I want to try and climb a boulder I just obsess over it completely. I think about it all the time. I don't always get really psyched on the idea of flashing the bloc, I just want to simply climb it. Though when the obsession is in high gear I often times feel as if I've already climbed it, and I haven't even seen it. What does a typical week or month look like for you? Do you train a lot? Do you primarily climb outside? Cross train at all? JW: Well recently that has changed a lot. Normally I'm outside about 90% of the time and training very little. Although, the past 2 months since I've been injured I've been spending a ton of time trying to just stay in shape. Since I can't climb I'm mostly doing core, pushups, and hiking a ton. What is your current injury and how are you dealing with it? Have you many had injuries in the past? JW: So I injured my A2 Pulley on my ring finger. I'm not 100% on the severity of it but I think it was close to a full rupture. It's most definitely the worst injury I've ever had. Today is exactly 10 weeks off and the swelling is still there with mild pain. I'm slowly starting to incorporate very light climbing back into my routine but I'd say it'll be May till I'm 100% back. In the grand scheme of things though, it is a small amount of time. I spend so much of my life focusing on climbing and pushing my personal limits that this time off is actually quite nice. It's given me time to focus on other aspects of my life and get things in order here in Chattanooga. Of course, I can't wait to start climbing again but for now I'm not too worried about it. What do you think your best strengths in climbing are? Did you do anything to develop them or did they come naturally? JW: I'm just a very gymnastic climber. It's just something that feels most natural when I'm on the wall. I think it really has something to do with where I started climbing. The style in the Southeast is typically slopey and powerful so eventually my body just became accustom to this. You are known as an incredible boulderer, is this your main passion? Or do you have other types of climbing that you gravitate towards as well? JW: Yeah I would say my main passion is for bouldering but I really enjoy every type of climbing. Motivation comes and goes for certain things and you never know where it'll take you next. For me it's the New River Gorge, so much potential there for every type of climbing. Describe your ideal day, climbing or otherwise. JW: Wake up around 8. Coffee like my life depended on it. Climbing till the sun goes down. Dinner and beers with a crew of rad people! What are your 3 favorite pieces of Metolius gear and why? J: 1. Super Chalk because it's the best on the market! 2. Grip Saver Plus. It comes in handy so much right now but I also use it as a preventative measure! 3. Waldo Harness. Best bolting harness I've ever used. I could sit in this thing for a month and never get uncomfortable.